Attorney General William Barr says he thinks “spying did occur” on Donald Trump’s presidential campaign, suggesting the origins of the Russia investigation may have been mishandled. He did not say what “spying” had taken place but seemed likely to be alluding to a surveillance warrant the FBI obtained on a Trump associate. He later said he wasn’t sure there had been improper surveillance but wanted to make sure proper procedures were followed. Still, his remarks give a boost to Trump and his supporters who insist his 2016 campaign was unfairly targeted by the FBI. Barr was testifying at a Senate budget hearing Wednesday that was dominated by questions about special counsel Robert Mueller’s Trump-Russia investigation. Attorney General William Barr says he doesn’t know if Robert Mueller supported his conclusion that the special counsel’s report had insufficient evidence to establish that President Donald Trump obstructed justice. The comment came as Maryland Sen. Chris Van Hollen asked Barr whether he agreed with Mueller’s assessment that there were “difficult issues” of law and fact concerning whether obstruction happened. Barr summarized that assessment in a letter to Congress March 24. Barr refused to answer Van Hollen’s question several times, saying he would say more when the report was out. Barr said in the summary letter that Mueller did not reach a conclusion on whether the president obstructed justice, instead presenting evidence on both sides of the question. Barr said he and Deputy Attorney General Rod Rosenstein decided that the evidence was insufficient to establish obstruction. Barr made the comments as senators questioned him on the specifics of the report and what he would be redacting. Democrats have said they won’t accept redactions and will fight to get the full report. Special counsel Robert Mueller didn’t say he wanted Congress to decide whether President Donald Trump committed obstruction of justice. But he didn’t say Attorney General William Barr should decide either. That’s what Barr is telling Congress during his testimony before a Senate subcommittee hearing. Mueller found evidence on both sides of the question of whether Trump obstructed justice in the Russia investigation, according to Barr’s earlier letter to Congress about Mueller’s investigation. Barr is defending his decision to then step in and determine there wasn’t sufficient evidence to establish that the president violated the law. Barr says it was his responsibility as attorney general to make the call. He says he’s looking forward to explaining his reasoning after he releases a redacted version of Mueller’s 400-page report in the coming days. Attorney General William Barr says he won’t withhold any derogatory information about President Donald Trump contained in special counsel Robert Mueller’s report. Barr tells Congress that concerns about protecting the reputations of people not criminally charged in the Russia probe don’t apply to “office holders” such as the president. That was one of four criteria Barr has said he is using to redact Mueller’s nearly 400-page report. Barr has said he expects to release a redacted document within a week. He is facing questions about his handling of the report during a Senate subcommittee hearing on Capitol Hill. Attorney General William Barr says he plans to review the origins of the FBI’s investigation between Russia and the Trump campaign. The Justice Department’s inspector general has already been investigating the early days of the FBI’s Russia probe. Barr says he wants to pull together the different reviews underway within the Justice Department and see if there are remaining questions that need to be addressed. A person familiar with the process said Barr is forming a team to review the origins of the FBI investigation. Trump, speaking to reporters Wednesday at the White House, decreed it an “illegal investigation” conducted by “dirty cops.” The president did not name them but has previously blamed Justice Department officials and former FBI Director James Comey. 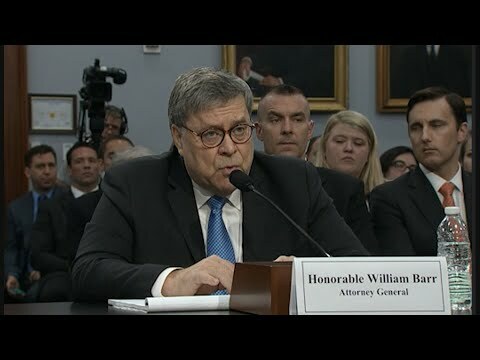 Attorney General William Barr has a team reviewing the origins of the FBI’s counterintelligence investigation into the Trump campaign and Russia, according to a person familiar with the situation who insisted on anonymity to discuss internal discussions..
Trump also stated that “I don’t care” about the report from special counsel Robert Mueller that Barr says he will release in the coming days in redacted form. Despite that declaration, the president has repeatedly tweeted about the report in recent days. Mueller didn’t find a criminal conspiracy between Russia and Trump. He did not rule on obstruction of justice, though Barr and Deputy Attorney General Rod Rosenstein ruled Trump did not. Attorney General William Barr is returning to Capitol Hill for a second time this week as lawmakers, the White House and the American public anxiously await his release of special counsel Robert Mueller’s report on potential ties between Russia and the Trump campaign. Barr will speak to a Senate appropriations subcommittee Wednesday about his department’s budget. But like members of the House on Tuesday, senators are expected to be more interested in the nearly 400-page Mueller report than budget details. Justice Department officials are scouring the report to remove grand jury information and details relating to pending investigations, among other materials. Democrats say they will not accept redactions and want the full report’s release.